The parents of 5 teenage girls who were sexually assaulted by people they met through MySpace are suing the popular networking site for "negligence, recklessness, fraud and negligent misrepresentation". The parents claim that MySpace didn't do nearly enough to protect their children (all 14 or 15 year old girls) from online predators. The damages sought in this particular suit have not been disclosed but a similar suit against MySpace back in June asked for compensation for damages in the amount of $30 Million. I had no idea that it was MySpace's job to make sure young girls didn't go on dates with skanky child molesters they met online. 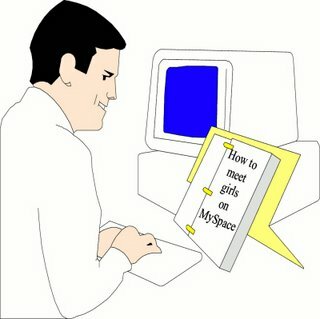 If I had known that MySpace offered free parenting, I would have had a slew of kids a long time ago, set them up in front of the old computer, and headed out to the bars. Then I could sue MySpace for millions when the kids didn't get fed or bathed or were eaten by wild dogs. Then I could live a sweet life. Don't get me wrong, I'm not completely blaming the parents. Mostly I blame the child molesters. And Al Gore for inventing the internet. That pesky Al Gore. First he invents the internets and children get molested. Then, he points out the facts about global warming and the polar bears start dying. Good thing we didn't elect him president...oh wait, we did. Good thing he was robbed out of the presidency, who knows where we would be now.